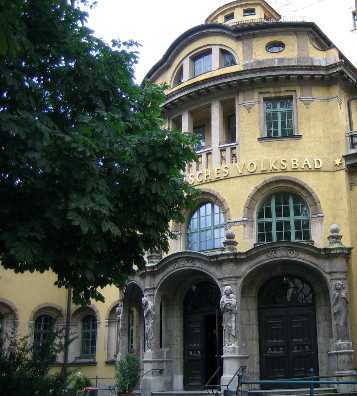 This summer, I spent a day at the Volksbad (public baths) in Munich, Germany. Here, in the United States, a day at the spa is considered something the frivolous wealthy do. But, in Europe, particularly Germany, the public baths are for the “volks”, the people. For a mere €16.00 (about $20.00) you can pamper yourself for as long as you like. Our day began as usual. Breakfast was dark German bread smeared with butter and layered with Italian salami, tomatoes, snippets of cress and whole leaves of basil, and a pungent sheep cheese made in the Tegernsee Valley. Fruit was followed by a cup of rich coffee or tea. After our leisurely breakfast, we packed up our swimming suits, towels, shampoo, soap, olive oil, and packets of facial mask. Being new to this, I did what I was told and didn’t ask questions. We walked though the park, enjoying the chill of the misty morning. The mile and a half walk brought us to the palatial entrance to the Karl Müllers’sches Volksbad. Golden stucco, red tiles, and a central clock tower frame the stunning entrance. Built in 1901, its Mediterranean feel convinced me that the sun was actually shining and we were standing only minutes from the sea. The illusion continued as we climbed the steps to begin our day at the spa. My friend, Erna Erhard, paid our fee, collected our keys, and gently lifted my jaw back into place. I suppose my awe was fueled mostly by the building, but going to public baths is not something I am familiar with. In the United States, public baths seem to have an aura of hedonism, self indulgence, and clandestine activities (think spy movies). With our keys, we entered and found a wall of small safes. This is where valuables were stashed. Then, through a simple sunroom that made the white plastic chairs look elegant, we found our “cabins”. Each cabin had a bed with crisp, clean linen, a small chair, a folded sheet, and a framed mirror. Under the motherly care of Erna, I donned my swimming suit and wrist bracelet that held my key, grabbed my swim cap, and headed through the giant double doors at the end of the hallway. She herded me into the showers for a quick rinse off and led the way past the warm pool to the cool pool. And, cool it was. The 1901, pool was lined with tiles of blue and white with walls and carvings of warm yellow marble. Multiple archways along the perimeter of the pool led to dressing rooms, showers, and other areas of the spa. Above, the pool was surrounded by a balcony. Over all, the high, ornate dome had gold and crystal chandeliers that were unnecessary because of all the light filtering through leaded windows. Children were having swimming lessons as we entered the pool and lap swimming took place wherever there was an opening. I thought it was a bit contrary to the German character to have their water exercise be so unstructured, but it worked and I saw no collisions. At the shallow end of the pool there was a marble wall with the head of a lion carved into it. From the mouth of the lion came a torrent of water. I thought it was decorative until I saw kids standing under its strong pressure. We swam for a half hour and then relaxed in the shallow end. I headed for the lion’s head. I could not believe how strong the stream of water was. For it to hit my shoulders or head, I had to stand at a nearly 45° angle to keep from being knocked over. The depth of the massage was astounding. From my lower back to the top of my head all tension was pummeled out of me. From the pool we returned to the cabins to gather soap, shampoo, olive oil, and packets of facial mask. Wrapped, toga style, in my sheet, I was led to the women’s spa. In a lovely glass and marble room with two small pools, showers, and benches, we left our wet suits in the first of the dry saunas. The three saunas are in a row and each hotter than the last. I had not brought pool flip flops and so could not go into even the middle sauna. The marble floor burned my feet and I leapt back out the door. She led me instead to another sauna that was hot and moist. After swimming, my blood was thin and warm. As soon as I entered the sauna I began to sweat. I spread out my sheet to sit on and enjoyed the heat on my dripping skin. Once an hour a spa attendant enters the sauna with a bucket, a small towel, and a ladle. She hung a closed sign on the door and I thought we would be asked to leave. Instead, she began ladling the water onto the heater, making clouds of fragrant, mint and citrus, steam. Small moans of pleasure escaped from each of us, but she was not finished. With small flicks of her wrist, she began twirling the towel around the hot cedar room. The hottest air had risen immediately to the top. She used the towel to stir the air. The temperature on my low bench must have risen 10 or 15 degrees as it mixed with the cooler air around me. Alternately, she added more scented water to the heater and stirred the air. How could this possibly get any better? Little did I know! Holding a corner of the small towel in each hand, she somehow flipped it carefully toward the face of each of us in turn. The intense heat was both pleasurable and painful. As my turns came, I almost wanted to shrink away from her. When she turned to leave, she received many contented thank yous. After the sauna, we took a quick, cool shower and lowered ourselves into the larger pool. Small and circular, it was barely warm on our skin. It was lovely. I thought it would be a wonderful place to spend long hours. It was not to be. We stayed in the pool for about a minute and then entered the smaller pool. I am sure ice cubes could survive in that pool. Erna walked through without a flinch while I huffed and puffed, trying to keep my efforts from echoing off the marble walls. In one side and out the other, we again entered the larger pool. The ritual was repeated two more times. At that point, the water in the warmer pool felt like needles all over my body. Somewhere between heavenly and excruciating, we stayed in the pool until the tingling stopped. Then we entered the steam room. All marble, the steam is continually shot into the room and can be regulated by a lever on the pipes. A lift of the lever and everyone and everything in the room disappeared in a fog of hot moist air. Again, the sweat began to roll of my body and I began to think longingly of my water bottle waiting outside the door. It had been emptied and refilled twice already. In the sauna and the steam room, voices were quiet. I was filled with the sensation of heat flowing into my lungs and the beads of sweat racing across my skin. The heat and humidity leave the mind empty of outside thoughts. By the time the steam room was visible again, I was feeling a bit light headed and chose to leave. I think you have to work up to all that sweating. Erna led me again to a quick, cool shower and again into the large pool. In a bit of a daze I followed her as we alternated between the warm and cold pools. Watching a woman standing in a framework of pipes with water spraying on her from head to foot, Erna leaned over and told me that the apparatus was called the “Iron Virgin”. She laughed at my surprise and then gave a smirk when I decided I had to try it out. I turned on the water valve and stuck my hand in. It was ice water! Little tiny jets of ice water shooting in all directions! It was too late. All the women knew I was a novice and waited to see what I would do. In I went. I could not breathe. When the pipes were full and the jets were bombarding my scalp, I jumped out, gasping for air. I do not know how it got its name, but once was enough for me. Back in the warm pool, it took a long time for the tingling to stop. When it did we headed for the showers for a lather and shampoo. Wrapped in sheets and with a facial masks on, we went upstairs to a plant filled room. Stretched out on a chaise lounge, I was as relaxed as I have ever felt in my life. Warm and clean to the very depths of my pores, I think I dozed. While we rested, someone placed a large platter of freshly cut fruit on a table in the sunroom. We sat in the plastic chairs and nibbled on sweet morsels. Back in our cabins, I stretched out on the bed for a few moments before using the olive oil to help rehydrate my skin and hair. After taking a long time to dress, we went to the small restaurant in the building and ordered a delicious salad. Erna does this once or twice a month, but it was all new to me. I was worn completely out. And, even though I was promised rejuvenated body and soul, I was grateful when she suggested we take the streetcar home.